Just minutes from the magnificent views of Skyline Drive in the Shenandoah Valley, Virginia’s Luray Caverns draws 500,000 visitors each year deep underground to stunning sights and sounds including its world famous Stalacpipe Organ. Since 1878, Luray Caverns has delighted and amazed those who brave its depths. 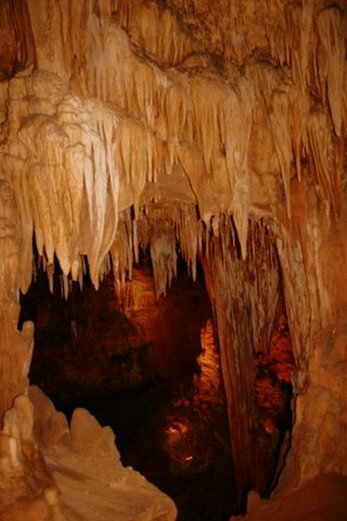 In 1880, a delegation of nine scientists from the Smithsonian Institution said "It is safe to say that there is probably no other cave in the world more completely and profusely decorated with stalactite and stalagmite ornamentation than that of Luray." Impossibly large stalactites hang from ceilings as high as 10 stories above your head in cathedral-sized rooms with intriguing names such as Giant’s Hall and Dream Lake as you wind and wander through 1.25 miles of paved walkways, which sometimes include fairly steep inclines and descents. The Car and Carriage Caravan Museum is a just outside the cavern entrance and admission to the museum is included in the price of the caverns’ admission. The Car and Carriage Caravan Museum is a "tour of milestones in transportation, including authentically restored cars, carriages, coaches and costumes, dating from 1725 to 1941." One of the most unique is the 1892 Benz, one of the oldest cars in the country still in operating condition. The collection also includes an 1840 Conestoga Wagon, a 1908 Baker Electric, a 1913 Stanley Steamer, and Rudolph Valentino's 1925 Rolls Royce. In the Spring of 2010, the Luray Valley Museum and Gardens will open with 9 buildings housing Shenandoah Valley culture including a working blacksmith, a gold-mining station, a barn filled with period livestock and agrarian farm equipment. Historic local buildings have also been transported to the site and restored to represent a small farming community from the 1800s. The garden will include a heirloom variety of fruits, flowers and vegetables, trails around a small lake, apple orchards, live music and a craft area showcasing a different skill each month from the eighteenth, nineteenth, and twentieth centuries. Luray Caverns is located 10 minutes from the central Shenandoah Valley entrance, less than a day’s drive from Williamsburg, Virginia, the Pennsylvania Dutch region, and the Great Smoky Mountains. For LGBT travelers - The Piney Hill Bed & Breakfast in Luray, VA is a gay owned B&B in the heart of the Shenandoah Valley. Phone 1-540-778-5261 for more info about Piney Hill B&B. Watch our video of Luray Caverns below.